Das Modul Burney Splice wird benötigt um auf unserem Dachboden das Sägewerk und das Papierwerk gemeinsam aufstellen zu können. Zu diesem Zweck wird das Modul aus drei Segmenten bestehen und zwei fremo-AmericaN-iNdustires-Abgänge und einen Fremo-AmericaN-Abgang haben. I need this module to place the sawmill and the paper plant on the attic. The module will feature three connections, one AmericaN and two AmericaN iNdustries. An den noch offenen Abgang kommt der von der MR bediente Dicalite-Anschließer zur Hopperbeladung mit der Andeutung eines Steinbruchs in Cayton. To the third connection I will attach a small Dicalite Quarry module. Zu Hause wird Burney Splice links, mit der Wye, an die Paper Mill angeschlossen, im Norden wird das fremo-AmericaN-iNdustries-Modul Cayton Dicalite Quarry angeschlossen und im Süden Die Fremo-AmericaN-Module Shaste Transition, Lake Britton Bridge und die McCloud Sawmill. On my home layout Burney Splice will be connected with the paper plant with the left wye. The northbound connection will feature the quaary and the southern connection connects to the "mainline" to the sawmill. 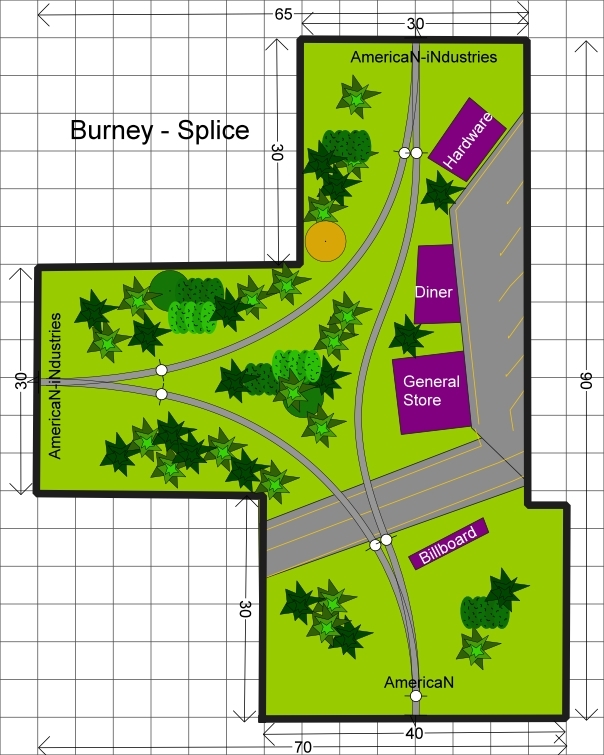 Burney Splice will show a typical transfer scene from branchline to industrial tracks. There will be a highway crossing the tracks, a Diner, a general store and a hardware show.